Can you spot the six discrepancies in this allegedly true story? I met John on OKCupid. He seemed funny, he didn’t exhibit any signs of oddness, and he looked hot. We agreed to meet for coffee at Tryst. I put on my finest coffee date makeup, and set off that Saturday. I couldn’t believe it: for once, the date was going really well. In fact when we finished coffee, neither of us wanted it to end. “I’m going to a reception just across the road, at the W Hotel,” he said. “Want to join me?” I agreed. After going to the restroom to splash water on my face, we set off. As we entered the hotel, I saw a huge sign: The Royal Society of Alien Abductees Welcomes You to our 2001 Annual Conference. “Haha,” I said to Jonathan. “I bet The W is full of interesting people today!” “Definitely,” he said. We grabbed drinks… and then I saw the poster. Framed with a green, glowing border, there was my date’s face, above the tagline: “My abduction made me an alien overlord.” Errr… Sure enough, the room was called to attention and John stepped up to the mic. He started talking – well, it was more of a rant – about how he had been abducted, crowned, and returned to kill all humans. I made for the nearest exit. An alien overlord was one thing, but an alien overlord with murderous intent? I’d been on a lot of strange OKCupid dates, but I somehow knew that this was where I had to draw the line. 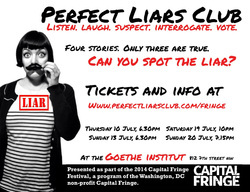 * It's called the Flyer Challenge because the story is on the back of our Capital Fringe Festival flyers!